1858 2d Deep Blue, SG 36A, Plate 6, Large Crown, Perf 16. A superb used example with good colour. 1841 2d Blue, SG 14F, Plate 3, lettered B-C. A very fine four-margin example cancelled by a superb No 10 IN MALTESE CROSS. Cat £1500. 1849 2d Blue, SG 14, PLATE 4, B-H, 'SPECTACLE' VARIETY, Spec ES140. Very fine used. Cat £1000. 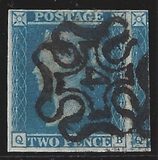 1870 2d Blues, SG 46, Plate 13, x 2, tied to entire addressed to Copenhagen by London duplex. 1858 2d DEEP BLUE, SG 36A, Perf 16, Large Crown. A superb example tied to cover to Manchester by a very fine London '18' in oval of bars cancellation - SCARCE ON COVER. 1878 4d SAGE GREEN, SG 153, PLATE 16 and 2d Blue, SG 46, Plate 15, tied to cover addressed to "TRIESTE, AUSTRIA" by very fine LONDON '77' LATE FEE DUPLEX. ATTRACTIVE AND SCARCE. 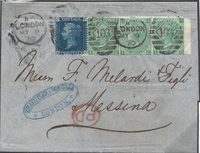 1870 Cover to Messina, Sicily, prepaid at 3/-, six times the normal 6d per ¼ oz rate, with a strip of three 1/- Green, SG 117, Plate 4 and a 2d Blue, SG 46, Plate 13, paying the 2d Late Fee. Tied by London 103 duplex. 1854 2d DEEP BLUE, SG 19, Plate 4, strip of THREE, S-F/S-H plus a single, tied to entire to Amsterdam by London '40' numerals sent "Via Ostende". 1849 2d Blue, Plate 4, SG 14be, T-H RE-ENTRY, Spec ES14C. A very fine used four-margin example. Cat £250. 1867 2d Blues, SG 45, Plate 9, strip of THREE tied to envelope (one flap removed) addressed to Montreal "P Canadian pkt" by a Blackpool duplex. 1855 2d BLUES, SG 23, PAIR, J-A, J-B, PLATE 4, Small Crown, Perf 14. A very fine pair tied to Entire from London to Marseilles. 1849 2d Blue, SG 14, Plate 4, R-A/R-D. A very fine used four-margin horizontal STRIP OF FOUR (R-D vertical crease). 1841 2d Blue, SG 14f, Plate 3, I-K. No 1 IN MALTESE CROSS. Very fine used with four margins. 1853 2d Blue, SG 14, Plate 4, B-B/B-D, strip of three together with a 1d Red-Brown, SG 8, tied to Registered cover from PETERBOROUGH to Clay, via Thetford, Norfolk. 1841 2d Blue, SG 14F, Plate 3, R-L. A very fine four-margin example cancelled by a very fine No 4 IN MALTESE CROSS. 1841 2d Blue, SG 14F, Plate 3, O-C. Very fine four margins, cancelled by a very fine upright No 10 IN MALTESE CROSS. Cat £1500. 1841 2d Blue, SG 14F, Plate 3. Very fine, four margins, cancelled by a very fine No 9 IN MALTESE CROSS. Cat £1200. 1853 A RARE FRANKING TO NORWAY, franked with two horizontal strips of FOUR 2d Blue, SG 14, Plate 4, R-A/R-D and R-E/R-H plus a 1d Red-Brown, SG 8, F-A, all tied by MALDON 494 numerals. BPA CERTIFICATE. 1841 2d Blue, SG 14f, Plate 3, Q-B A very fine four-margin copy cancelled by a very fine No 4 in Maltese Cross. 1849 2d Pale Blue, SG 13, Plate 4, Q-C. A very fine used example with four LARGE margins! 1854 2d Blue, SG 19, Plate 4, Small Crown, Perf 16, D-F. A very fine example cancelled by a superb '186' DUBLIN cancellation in GREEN. 1869 2d Blue, SG 46 , Plate 13. A very fine used Block of Six with KENMARE circular datestamps.